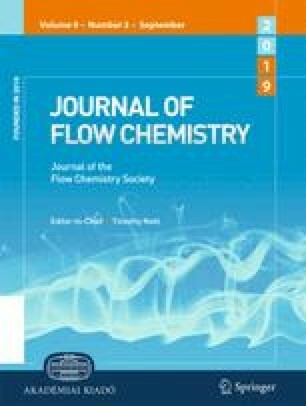 In this work, the synthesis of N,N′-dialkyl-6,6′-dibromoisoindigo derivatives by continuous-flow chemistry is explored as a means to enhance material availability and structural diversity, in particular toward the application of isoindigo-based semiconductors in high-performance organic photovoltaic devices. The individual steps in the conventional batch synthesis protocol are evaluated and, when needed, adapted to flow reactors. To overcome the low solubility of nonalkylated 6,6′-dibromoisoindigo in common organic solvents, the flow condensation reaction between the 6-bromo-isatin and 6-bromo-oxindole precursors is evaluated in polar aprotic solvents. Dialkylation of 6,6′-dibromoisoindigo is readily performed in flow using a solid-phase reactor packed with potassium carbonate. In an alternative strategy, solubility is ensured by first introducing the N-alkyl side chains on 6-bromo-isatin and 6-bromo-oxindole (accessible via a highyielding flow reduction of alkylated 6-bromo-isatin), followed by condensation using the conventional method in acetic-hydrochloric acid medium. The N,N′-dialkylated 6,6′-dibromoisoindigo derivatives indeed show enhanced solubility in the hot reaction mixture compared to the non-alkylated material but eventually precipitate when the reaction mixture is cooled down. Nevertheless, the condensation between both alkylated starting materials is achieved in flow without any blockages by keeping the outlet from the reactor heated and as short as possible. The latter strategy allows the preparation of both symmetrically and asymmetrically N-substituted isoindigo compounds. Supplementary material is available for this article at https://doi.org/10.1556/1846.2015.00033 and is accessible for authorized users. Supplementary material, approximately 1432 KB.